Barrow Hill with its church and summit with a large shining steel cross forms a prominent skyline feature of the Black Country to the West of Dudley. Below the summit on its flanks are large quarries. 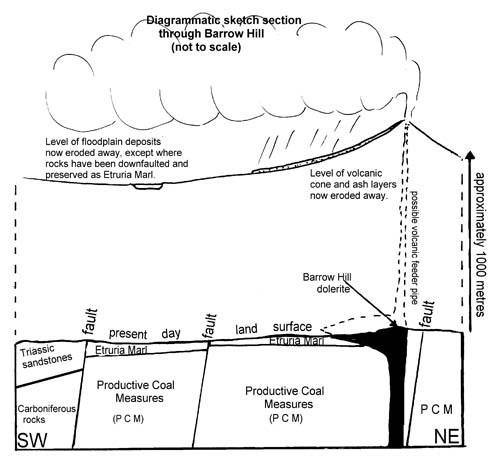 Barrow Hill is a prominent hill of hard dark igneous (volcanic and intrusive) rocks of an olivine basalt type that burst its way into the local country rocks about 300 million years ago. Large quarries have been excavated in the hill to extract the basalt as a road aggregate and these now abandoned quarries have many excellent rock faces of high scientific and aesthetic value. 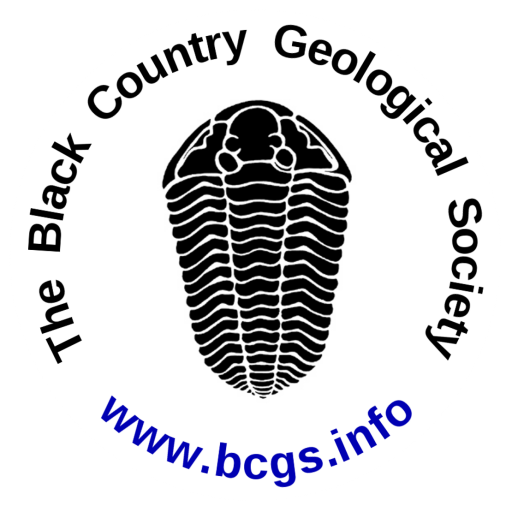 This site is important both in terms of the unique geological features and its key position in the interpretation of the volcanic history of the region as exposed in other local sites such as Rowley Quarries, The Clee Hills and other parts of the region. 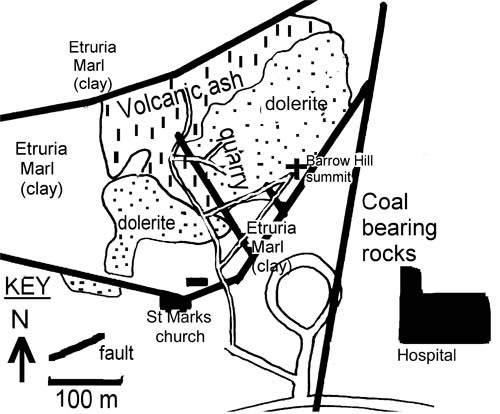 Altered blocks of the country rock which were ripped off the walls of the area intruded by the molten mass and adsorbed into the melt where they were partially ‘cooked’ and altered ( these now exist as highly altered xenoliths (formerly blocks of red silty clay from the surrounding etruria marls) with networks of calcite veining). Features related to the slow cooling and solidification of the molten rock, in particular sets of fractures and shrinkage cracks which give rise to weakly developed columnar jointing. The evidence seen here leads to the conclusion that this spot is at the edge of the main dolerite emplacement where hydrothermal vents reached up possibly only a matter of a few hundreds of metres to the ancient ground level which was eroded away long ago. Weathering features including a full soil profile from turf to solid rock, and classic rounded ‘onion weathering’ (exfoliation). The western quarry has carbonaceous materials and apparent volcanic ejecta /agglomerates which strongly implies that this is the volcano site for the ash beds at the associated SINC at Tansey Green which contain 3d preserved primitive conifers in life position. The site was subject to significant scientific debate between the 1920’s and 1940’s concerning the interpretation of the hill as volcanic, intrusive or both and many papers have been published on the site and its surroundings. These features conspire to make this a particularly important geological site and some clearance, quarry footpath establishment and signage would significantly enhance the general amenity of the site. The quarry is best approached from the car park adjacent to the church (SO915893). Follow the footpath from the car park to the To the north west, and a little way below you, you will see the old quarries and their spoil heaps.